A Very Exciting Entry Indeed: Robin McKinley & Presents! So during the Sirens conference I was at, when we were doing the Golden Age of YA panel, Rachel Manija Brown (All The Fishes Come Home To Roost), Janni Lee Simner (Bones of Faerie, Malinda Lo (Ash) and me (well, The Demon’s Lexicon, but I hope you guys know that by now) were all talking about how we feel this latest wave of lots of, and lots of really terrific, young adult fiction is inspired by the young adult books we were reading as we developed as writers. Lots of names were mentioned, but the author that all four of us said we were inspired by was Robin McKinley. Except that Sylvi and Ebon instantly understand each other completely. Cue magicians yelling about how it is Unholy and Taboo, pegasus and human politics, Forbidden Meetings (Some Involving Balconies, I Find It Romantic Okay), and the looming threat of war. In short it is an excellent book you guys. Now I secured an advance copy of Pegasus, which is how I know these things, and after I did so nothing made me happy but pestering its author, making vile and unwarranted insinuations about Sylvi and Ebon’s relationship as is my way (ROBIN: Theirs is currently a platonic relationship. SARAH: Or is it? ROBIN: What is wrong with you, get away from me. SARAH: He’s a fine figure of a pegasus is all I’m saying…). It seemed like we had one of two choices. Option A: Robin McKinley puts Mace into her rose sprayer, and uses it on me. Option B: I babble about Pegasus in public. We went with Option B. Also, there are going to be prizes. Fancy interview with Robin McKinley and prizes, y’all! Also, she uses footnotes: the blog is never going to be this fancy again. SARAH: So in the book, humans and pegasi share a land: pegasi were the original inhabitants but they were beleaguered by terrible beasties, so when the humans arrived they were welcomed with open hoofish-hands. The two races formed an alliance, and the royals get assigned royal pegasus attendants. Honestly it reminded me of a bit in Irish history, where the king of one province in Ireland stole another king’s province, and the second king was like ‘Uh, the English? Door’s wide open. PS I got a marriageable daughter. Just sayin’.’ Colonisation and alliance, complicated things in the real world, and even more so between humans and nonhumans. Did anything in history inspire Pegasus? In terms of watching my fellow human beings make utter horses’ asses of themselves on a global scale I have lived too long already*** but as I get older the thing I get more and more conscious of, or maybe I mean obsessed with, is the way Everything Is Connected. And from that inevitably comes the dire realisation of Personal Responsibility. I’ve taken a certain amount of stick over the decades for writing too many stories about princesses and the grand and titled generally and thus making my characters inaccessible to my readers. Erm. Well, obviously I don’t agree, or I wouldn’t keep writing stories about princesses (we’re all clear that the heroine of PEGASUS—the Standard McKinley Heroine—is a princess? ), but one of the uses of royalty I think is to have a kind of heightened ordinariness. This clearly insupportable theory probably comes from having read way too many fairy tales at a young age—remember I was starting to read for myself in the Early Mesozoi—I mean the 1950s, before ‘young adult literature’ was invented, let alone ‘urban fantasy’. I didn’t even meet LOTR till I was eleven. I was already totally ruined by Andrew Lang by then. And while one of the tangential attractions of my favourite fairy tale Beauty and the Beast is that Beauty is not a princess, well, the Beast is usually a prince or some major aristo, and he’s certainly wealthy. And the folk and fairy tales that bent my young imagination in irredeemable ways tend to have royalty either as the central characters (the guys) or as the reward (the girls). So as I came out of my story-telling starting gate snarling I WANT GIRLS IN BOOKS WHO DO THINGS royalty seemed like one of the basic playing pieces. Royalty is where a lot of paths cross without your having to make them cross: Default connectedness and built-in responsibility. You can just sit there playing eenie meenie about which way you’re going to go. Except, of course, the story won’t let you. This way, it will say sternly, slipping the chain round your neck. And that made me go ‘OH’ both because it’s true, it’s something that I love in books (eyes meeting across a crowded room kind of love, pfaugh, talk to each other)! ROBIN: I. COULD. NOT. AGREE. MORE. Biiiiiiiig major fixation here. Second only to the Girls Doing Things fixation. I mean, fine, that your eyes meet across a crowded room. But after you make your way through the crowd, breathing heavily and using your elbows a lot, talk to each other. SARAH: and because I think you took this common theme of yours a step further with Pegasus. In your previous books, people talk to each other and come to understand each other, but in Pegasus the problem and the miracle of communication is literalised. Sylvi and Ebon are members of two different species who are not supposed to be properly capable of talking to each other, and yet who can. Did you think about it as literalising your favourite theme, of bridging gaps and creating love through communication? To employ a Metaphor, what new alleys inside a favourite city were you able to create? SARAH: The types of beast vary in your books: foreigner regarded with suspicion, actual beast, vampire, dragon, dude made of fire. In this case, it’s a pegasus: something out of myth, something so beautiful it fills humans with dazzled amazement. (Uh, not like that. Though well, I don’t know. Ebon is a fine figure of a pegasus. So strong and manly, and also with excellent sculpting skills.) What made you think of turning Pegasus from one mythological horse to a race of horses – what drew you to them? VERY IMPORTANT, NO, CRUCIAL POINT. PEGASI ARE NOT WINGED HORSES. NOT. NOT. NOOOOOOOOOT. GOT THAT? GOOD. EXCELLENT. There’s been way too much ‘Robin McKinley’s race of flying horses’ already and the book isn’t even out yet. PEGASI ARE NOT FLYING HORSES. THEY’RE PEGASI. Are deer horses with split hooves and big ears? No. Are cheetahs really fast tigers with spots? No. Are hippopotamuses wet rhinos without horns? No. Are pegasi horses with wings? NO. Now. Ahem. Back to the question. If you stalk me a lot . . . I mean, if you’ve read much of either my blog or web site, you’ll already know that I like to say that I don’t make my stories up, they happen to me. I had no conscious intention of doing anything with pegasi, which, before I met them, I assumed were flying horses, and while the flying part was kind of exciting and I have been seriously horse mad pretty much all my life, for some reason I always thought pegasi were kind of a snore. Oh, and yes, I know the old dad was Poseidon (Poseidon? And you get a flying horse? ), mum was Medusa story (dad was Poseidon and mum was Medusa? And you get a flying horse? Seriously?) and he was born out of his mother’s severed neck ewwwwww (Yo, ancient Greek dude, can we talk about these issues you have around women and childbirth?) . . . but that was clearly bogus (and to do with the ickiness of the ancient Greek psyche). SARAH: The Greeks, man. Swans. Showers of gold coins. Helen of Troy was born out of an egg. It must have been a real relief when she came out hot – and then later not so much. And there is absolutely no snaky hair in PEGASUS or PEG II. I promise. SARAH: I love Sylvi’s parents – her tall warrior mother, and her wee fearsome diplomat father. I love them a lot. I think we’ve all had the experience of getting really invested in a minor character: are there minor characters from your books who you have really cottoned to? ROBIN: Always. Starting with Ger back in BEAUTY. Mel in SUNSHINE (as I’ve said elsewhere) is the Most Criminally Underused Character in the McKinley Oeuvre and may be the single strongest reason for any remote possibility of another story about Sunshine some day.††† I’ve had a crush on Jack Dedham in SWORD for thirty years. There’s something mysterious about Sibyl in OUTLAWS. I know what happens to most of Robin’s remaining band; all I know about Sibyl is that there’s a mystery. Arrrgh. I would like to know more about Lissar’s friend Lilac in DEERSKIN. The list goes on . 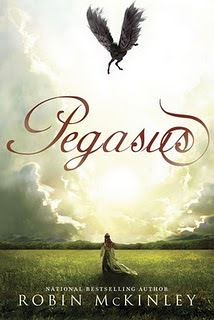 . .
I’m not going to talk about PEGASUS, I think, because this writing-a-second-book-out-of-the-same-story thing is strange to me and I’m feeling Very Superstitious. There are a couple of minor characters in PEG I that I’m still hoping are going to rip up some radical scenery in PEG II. ROBIN: I think cruel and diabolical is a sound, judicious description of the end of PEGASUS, yes, and I’m very sorry about your hair. If I were either already fabulously wealthy from my previous forty-six New York Times best-sellers or a faster writer, I might have just hung onto it and produced one single epic volume, sold with its own carrying straps.‡ But I am not fabulously wealthy and gods know I am not a fast writer, and the hellhounds and I need to keep eating.‡‡ When the awful idea of whacking PEGASUS in half came to me my hand kept being relentlessly carried to the end of Chapter Nineteen‡‡‡. Stories are terrible bullies. If it’s any comfort, quite a lot of the writing of PEG II has been like walking on knives. Hot knives. (Little mermaid, pfaugh, as you would say.§) Because of the end of PEG I. * Specific? With this memory? I don’t do specific. Some of Peter’s family were here this weekend and they were sitting around discussing the History of Shakespeare’s History Plays. Wasn’t Richard III the one who runs across stage shouting, An Imperial Landing Craft! My kingdom for an Imperial Landing Craft! No, no, on second thought I’d rather have a Death Star! I’ll show that Henry Bolingb—Henry—uh—Tudor! —I covered for my crass ignorance on these exquisite matters by the well-known fact that I don’t frelling much like Shakespeare, and that’s aside from trying to keep his Richards and Henrys straight. PS: I hate Falstaff. HAAAAAAATE. ** Possibly not about the 2.3 minutes of a happy marriage. After (almost) twenty years Peter still makes sure there is chocolate and champagne in the house at all times, in case of emergencies, and asks me what I want for my birthday. I hear someone from the back row—where it’s dark, and I can’t see your face—asking what I do for him. Hey. I’m fun to watch. That has to be worth remembering to keep the champagne/chocolate stash topped up. *** Although I’m planning on living disgracefully long in total. You’re invited to my 100th birthday party in 2052. There will be champagne and chocolate cake. † Or neener neener if you prefer. †† And still is the usual system. One of the reasons I’m getting this interview in later than I should’ve is because PEG II: THE RATBAG has been torturing me more actively than usual this week. ‡ And a short list of possible alternative uses. Footstool. Barbell. Boxcar derby ballast. Coffee table: just add artfully cut glass sheet. ‡‡ Peter makes his own arrangements. Partly because he believes in regular meals. But the hellhounds need their chicken, and I need the occasional cute little cropped cashmere cardigan to keep my spirits festive. ‡‡‡ Not that it was Chapter Nineteen at that point. It was that MEEEP! bit after that other meep! meep! bit. § I am going to adopt pfaugh. It is so excellent. Why, yes. There is a Robin McKinley prize pack going. It contains Chalice (a beekeeper raised to higher things. A mysterious, hot man. And by hot I mean ‘mostly made of fire’), Sunshine (a vampire whose skin is reminiscent of undead mushrooms. A baker heroine. Sarah says ‘This vampire book is making me SO HUNGRY’ and worries her friends. Neil Gaiman says ‘this book is pretty much perfect’ so you don’t have to take Sarah’s word for it), a Pegasus poster – the cover is really pretty, you guys and a copy of Pegasus itself, which I think I’ve made clear, is a deeply desirable thing to have. In order to win, tell me about a relationship, platonic, arguably platonic or otherwise, in which the characters communicate and don’t just stare at each other, and it is awesome. And I hope you all enjoyed the Fancy Interview With Robin McKinley!